Deputy Chief Minister Chowna Mein flagged-off the vivid and colourful Sangskritik Subhajatra (traditional cultural procession) of 74th Asom Sahitya Sabha consisting of numerous tribes and communities from Assam and Arunachal held for the first time at Singpho Heritage Centre Bordumsa amidst presence of huge book lovers and literary enthusiasts from Assam and Arunachal Pradesh here today. “Cultural heritage is our identity and we should strive our best to protect it and put our efforts for its enrichment. Cultural exchanges play a pivotal role in bringing brotherhood amongst various ethnic groups and communities,” Mein said. 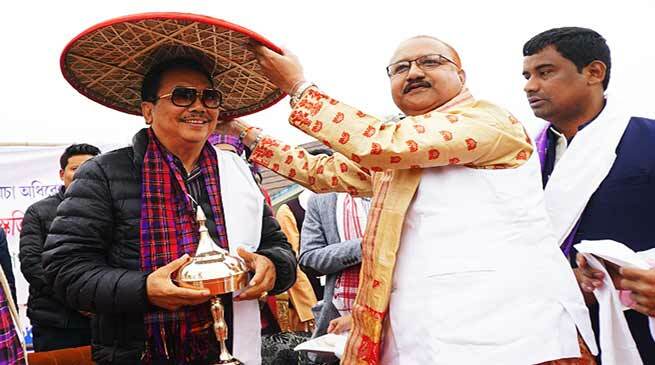 While lauding the efforts of the apex literary body of the Northeast, Asom Sahitya Sabha for organizing the historic event at Arunachal Pradesh, Mein said organizing such historic biennial conference in border areas like Bordumsa will be one step forward in bringing the rich cultural heritage of hills and plains together for benefit of all. Such events will further help promote a strong sense of fraternity, cultural affiliation enhancing mutual trust and assistance among the border people, he added. While offering his profound tribute to all the renowned personalities of the Asom Sahitya Sabha who contributed immensely towards the enrichment of Assamese language, literature and culture, Mein said that since inception the organization has worked for the cause of Assamese literature and culture in entire Northeast region and its branches in Arunachal has also immensely contributed towards the strengthening of the time tested bonds of all section of diverse society, culture and languages. He recalled the contribution made by some of the finest novelist and writers from State like Lummer Dai, Yeshe Dorjee Thongchi, Tokong Pertin, Kengsam Kenglang who brought the pristine beauty and struggle of life in hills in the form of Assamese literature and enriched the treasure. He also commended the efforts of Asom Sahitya Sabha in recognizing other ethnical literature as a core to its fold. Mein said that such efforts of bringing other ethnical language and culture would pave the way for building a stronger bond amongst various tribes and communities living in this part of the world. Mein said that the history of Arunachal can’t be separated from history of Assam as the roots of our journey in the development process in this hilly terrain land began with Assamese language. He added that still the langua-franca to communicate each other by various tribes in Aruanchal Pradesh is Assamese. The newly-elected President of Asom Sahitya Sabha Parmananda Rajbongchi, MLA Margherita (Assam) Bhaskar Sharma, MP (Assam) Rameshwar Teli, DC Namsai R.K.Sharma, ADCs from Namsai & Bordumsa together with a host of dignitaries including poets, writers, playwrights and eminent scholars across Assam and Arunachal were present. Later, the Deputy Chief Minister gave away the certificate of appreciation and memento to the participants of the youth conclave.